The company that supplies Zimbabwe with paper used to print it’s worthless banknotes has stopped supplying the regime after pressure was put on it by Germany’s foreign minister, Frank-Walter Steinmeier. The company, Giesecke & Devrient — a secretive, family-owned Bavarian company had been supplying paper for the printing of money to Zimbabwe since 1980. 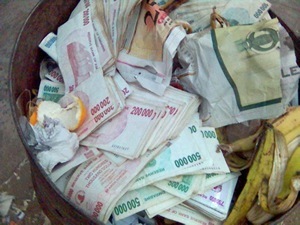 In a desperate move, the Zimbabwean government announced that is was cropping a whole lot of zeros (10 zeros!) off it currency and that it was going to allow older coins back into circulation. A $1 coin now is worth 10 billion of the old dollars. The money in circulation also has an expiration date on it so you’re SOL if you happen to hang on to it for too long. I not one for advocating meddling in other countries affairs but Mugabe who is reported to be worth Billions of US, yes US dollars has to go and by any means it takes! Ricin pie or bullet I don’t care as there are capable leaders standing by and the vast majority of the people are against him, just too scared and beat up to say otherwise. The only reason he is still in power is the pride of people like Thabo and other has been african revolutionaries. Previous Previous post: Colorado Weather – Hottest consecutive days over 90 on record.